This pack includes a set of 14' hi hats, a 16' crash and a 20' ride. Perfect for upgrading from factory cymbals that came with the drum kit, or an economical way to buy 3 new cymbals! This is cheaper than buying 1 cymbal of some comparable brands! Looking for a tough, light-weight case to lug you gear safely and securely? Look no further. These cases are built to last and will protect your gear from anything the environment or baggage handlers can throw at it. Suitable for 8 Cymbals, it includes 8 foam washer dividers. The centre spike locks into the lid when closed, so there's no need to screw a washer onto the spike to clamp the cymbals in place. Just flick off the lid and the cymbals are ready to go - Easy setup and pack down. 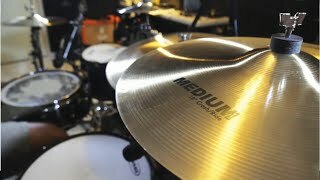 Capacity:- up to 8 cymbals - Largest size 21 inch.